The public sees clear winners and losers as a result of the government’s economic policies following the recession that began in 2008. In the public’s view, the beneficiaries of these policies are large banks and financial institutions, large corporations and wealthy people, according to a survey conducted earlier this month. Sizable majorities say government policies have helped all three at least a fair amount – 69% say that about large banks and financial institutions, 67% large corporations and 59% wealthy people. Meanwhile, fewer than a third say policies implemented by the government following the recession have helped the poor, middle class and small businesses. 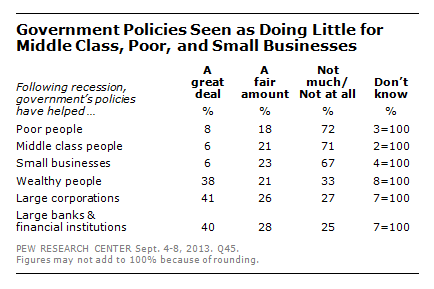 Roughly seven-in-ten say government policies have done little or nothing to help the poor (72%), the middle class (71%) and small businesses (67%). There has been little change in these perceptions since the question was last asked in July 2010. The public had a dim view of assistance that the government gave to banks and financial institutions during the recession, after the 2008 fiscal meltdown threatened many of them. A Feb. 2012 survey found that 52% of Americans thought bailing out the banks through the Troubled Asset Relief Program (TARP) was the wrong thing to do, while 39% supported the action. That was a big turnaround from 2008 when the crisis hit in 2008 and 57% had said TARP was the right thing to do.